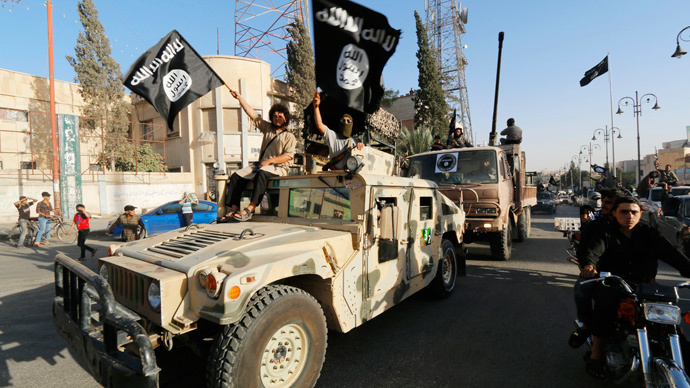 To beat ISIS, kick out US-led coalition ~ by Sharmine Narwani. US-led forces were helpless to stop Islamic State from scoring a hat trick, conquering the city of Ramadi in Iraq’s Anbar province, occupying Syria’s historic gem Palmyra, and taking over Al-Tanf, the last remaining border crossing with Iraq. The multinational, American-led ‘Coalition’ launched last August to thwart Islamic State’s (IS, formerly ISIS) march across Syria and Iraq…did nothing. And so Baghdad and Washington are pointing fingers, each accusing the other of being asleep on the job. Carter must have forgotten that Iraqis staved off an ISIS occupation of Ramadi for almost 18 months. He also forgot that it was Iraqis who defended and/or recovered Amerli, Suleiman Beg, Tuz Khurmatu, Jurf al-Sakhar, Jalula, Saadiyah, Khanaqin, Muqdadiyah, Baquba, Udhaim Dam, Tharthar Dam, Habbaniyah, Haditha, Al-Baghdadi, Mosul Dam, Mount Sinjar, Zumar, Erbil, Gwer, Makhmur, dozens of Christian villages in the Nineveh Plains, Tikrit, Samarra, Balad, Dhuluiya, Dujail, Ishaqi, Al-Alam, Al-Dour, Albu Ajil, Awja, Al-Mutassim, Mukayshifa, Ajil and Alas oilfields, Hamrin mountains, Baiji oil refinery, scores of villages in the provinces of Salaheddine, Diyala, Kirkuk, Anbar, and Babil – and the capital city, Baghdad. The Iraqis have shot back. Key MP Hakim al-Zamili blames Ramadi’s collapse on the US’s failure to provide “good equipment, weapons and aerial support” to troops. If ever there was an understatement, this is it. Washington’s long-stated objective of rallying together a vetted Sunni fighting force – or its equivalent in the form of a National Guard – has always served as a placeholder to avoid facing realities. One thing we have learned from IS gains in small and large Sunni towns alike, is that the extremist group prides itself on sleeper cells and alliances inside of these areas. Sunni tribes and families, both, are divided on their support of IS. And the militants ensure that everyone else falls in line through a brutal campaign of inflicting fear and pain indiscriminately. So the likelihood of a significant, anti-IS, well-trained and equipped Sunni fighting force emerging anytime soon is just about nil. So too is the idea of a US-led Coalition air force that can cripple Islamic State. Washington has run fewer sorties over Syria and Iraq in the nine months since inception of its air campaign, than Israel ran in its entire three-week Gaza blitz in 2008-09. Where were the American bombers when Ramadi and Palmyra were being taken? And why does the US Air Force only seem to engage in earnest when their Kurdish allies are being threatened – as in Kobani (Ain al-Arab), Syria, and Erbil in Iraq? If actions speak louder than words, then Washington’s moves in the Mideast have been deafening. Forget talk of a ‘unified Iraq’ with a ‘strong central government’. And definitely forget loudly-proclaimed objectives of ‘training moderate forces’ to ‘fight off IS’ across the Jordanian and Turkish borders in Syria. That’s just talk. An objective look at US interests in the region paint an entirely different picture. The Americans seek to maintain absolute hegemony in the Mideast, even as they exit costly military occupations of Iraq and Afghanistan. Their primary interests are 1) access to low cost oil and gas, 2) propping up Israel, and more recently, 3) undermining Russian (and Chinese) influence in the region. Clinging on to hegemony would be a whole lot easier without the presence of a powerful, independent Islamic Republic of Iran, which continues to throw a wrench in many of Washington’s regional projects. So hegemony is somewhat dependent on weakening Iran – and its supportive alliances. With the removal of Saddam Hussein in Iraq, the US inadvertently extended Iran’s arc of influence in a direct geographic line to Palestine, leaving the Israeli colonial project vulnerable. Former President George W. Bush immediately took on the task of destroying this Resistance Axis by attempting to neuter Iranian allies Hezbollah, Syria and Hamas – and failed. The Arab Spring presented a fresh opportunity to regroup: the US and its Turkish and Persian Gulf allies swung into action to create conditions for regime-change in Syria. The goal? To break this geographic line from Iran – through Iraq, Syria and Lebanon – to Palestine. When regime-change failed, the goalpost moved to the next best plan: dividing Syria into several competing chunks, which would weaken the central state and create a pro-US ‘buffer’ along the border with Israel. Weakening the central government in Iraq by dividing the state along Kurdish, Sunni and Shiite lines has also been a priority for the Americans. You only have to look at recent US actions in Iraq to see this unspoken plan in action. Washington’s most intensive airstrikes to date were when Kurdish Erbil and its environs came under threat by ISIS. Congress has breached all international norms by ushering through legislation to directly arm Sunni and Kurdish militias and bypass the central government in Baghdad. And despite endless promises and commitments, the Americans have failed at every hurdle to train and equip the Iraqi Army and security forces to do anything useful. A weak, divided Iraq can never become a regional powerhouse allied with Iran and the Resistance Axis. Likewise a weak, divided Syria. But without US control over these central governments, the only way to achieve this is 1) through the creation of sectarian and ethnic strife that could carve out pro-US buffers inside the ‘Resistance states’ and/or 2) through the creation of a hostile ‘Sunni buffer’ to break this line from Iran to Palestine. While Washington has long sought to create a buffer in Iraq on the Syrian border, it has literally spent years trying – and failing – to find, then mold, representative Sunni Iraqi leaders who will comfortably toe a pro-American line. But why ignore Sunni groups who are unreservedly opposed to IS? Aren’t they America’s natural constituents inside Iraq? The Takfiri extremist groups serve a purpose for Washington. IS has had the ability – where competing Sunni factions, with their ever-growing lists of demands from Baghdad, have not – to transform the US’ ‘buffer’ project into a physical reality. And Washington has not needed to expend blood, treasure or manpower to get the job done. Last week, the government watchdog group Judicial Watch published a secret (now declassified) 2012 US Defense Intelligence Agency (DIA) document that sheds light on American calculations in Syria. The DIA brief makes clear that the escalation of conflict in Syria will create further sectarianism and radicalization, which will increase the likelihood of an ‘Islamic State’ on the Syrian-Iraqi border, one that would likely be manned by the Islamic State of Iraq (ISI). So what did Washington do when it received this information? It lied. Since last year, numerous Iraqi officials have complained about the US airdropping weapons to IS – whether deliberately or inadvertently remains disputed. Military sources, on the other hand, have made clear that the US-led Coalition ignores many of the Iraqi requests for air cover during ground operations. If the US isn’t willing to play ball in Iraq’s existential fight against IS, then why bother with the Americans at all? Iraqi Prime Minister Haider al-Abadi is viewed as a ‘weak’ head of state – a relatively pro-American official who will work diligently to keep a balance between US interests and those of Iraq’s powerful neighbor, Iran. But after the disastrous fall of Ramadi, and more bad news from inside Syria, Abadi has little choice but to mitigate these losses, and rapidly. The prime minister has now ordered the engagement of thousands of Hashd al-Shaabi (Shiite paramilitary groups, commonly known as the Popular Mobilization Forces) troops in the Anbar to wrest back control of Ramadi. And this – unusually – comes with the blessings of Anbar’s Sunni tribes who voted overwhelmingly to appeal to the Hashd for military assistance. Joining the Hashd are a few thousand Sunni fighters, making this a politically palatable response. If the Ramadi operation goes well, this joint Sunni-Shiite effort (which also proved successful in Tikrit) could provide Iraq with a model to emulate far and wide. The recent losses in Syria and Iraq have galvanized IS’ opponents from Lebanon to Iran to Russia, with commitments pouring in for weapons, manpower and funds. If Ramadi is recovered, this grouping is unlikely to halt its march, and will make a push to the Syrian border through IS-heavy territory. There is good reason for this: the militants who took Ramadi came across the Syrian border – in full sight of US reconnaissance capabilities. Right now, the key to pushing back Takfiri gains inside Syria’s eastern and northwestern theaters lies in the strengthening of the Iraqi military landscape. And an absolute priority will be in clearing the IS ‘buffer’ between the two states. Eighteen months ago, in an analysis about how to fight jihadist militants from the Levant to the Persian Gulf, I wrote that the solution for this battle will be found only within the region, specifically from within those states whose security is most compromised or under threat: Lebanon, Syria, Iraq and Iran. I argued that these four states would be forced to increase their military cooperation as the battles intensified, and that they would provide the only ‘boots on the ground’ in this fight. And they will. But air cover is a necessary component of successful offensive operations, even in situations of unconventional warfare. If the US and its flimsy Coalition are unable or unwilling to provide the required reconnaissance assistance and the desired aerial coverage, as guided by a central Iraqi military command, then Iraq should look elsewhere for help. Iran and Russia come to mind – and we may yet get there. Iraq and Syria need to merge their military strategies more effectively – again, an area where the Iranians and Russians can provide valuable expertise. Both states have hit a dangerous wall in the past few weeks, and the motivation for immediate and decisive action is high today. Lebanese resistance group Hezbollah is coming into play increasingly as well – its Secretary-General Hassan Nasrallah has recently promised that Hezbollah will no longer limit itself geographically, and will go where necessary to thwart this Takfiri enemy. The non-state actors that make up the jihadist and Takfiri core cannot be beaten by conventional armies, which is why local militias accustomed to asymmetric warfare are best suited for these battles. Criticizing the US’s utterly nonexistent response to the Ramadi debacle yesterday, Iran’s elite Quds Force Commander Qassem Suleimani points out: “Today, there is nobody in confrontation with [IS] except the Islamic Republic of Iran, as well as nations who are next to Iran or supported by Iran.” The Iranians have become central figures in the fight against terror, and are right next door to it – as opposed to Washington, over 6,000 miles away. If the US has any real commitment to the War on Terror, it should focus on non-combat priorities that are also essential to undermine extremism: 1) securing the Turkish and Jordanian borders to prevent any further infiltration of jihadists into Syria and Iraq, 2) sanctioning countries and individuals who fund and weaponize the Takfiris, most of whom are staunch US allies, now ironically part of the ‘Coalition’ to fight IS, and 3) sharing critical intelligence about jihadist movements with those countries engaged in the battle. It is time to cut these losses and bring some heavyweights into this battle against extremism. If the US-directed Coalition will not deliver airstrikes under the explicit command of sovereign states engaged at great risk in this fight, it may be time to clear Iraqi and Syrian airspace of coalition jets, and fill those skies with committed partners instead. May 27, 2015 in Iraq, Syria.